For this design challenge, we are to design, build and program a robot that is able to visit a set amount of spots (houses), for a set amount of time and exit the area. This does not take a special design for the robot- a simple design will work fine. This design challenge is mostly about the programming. 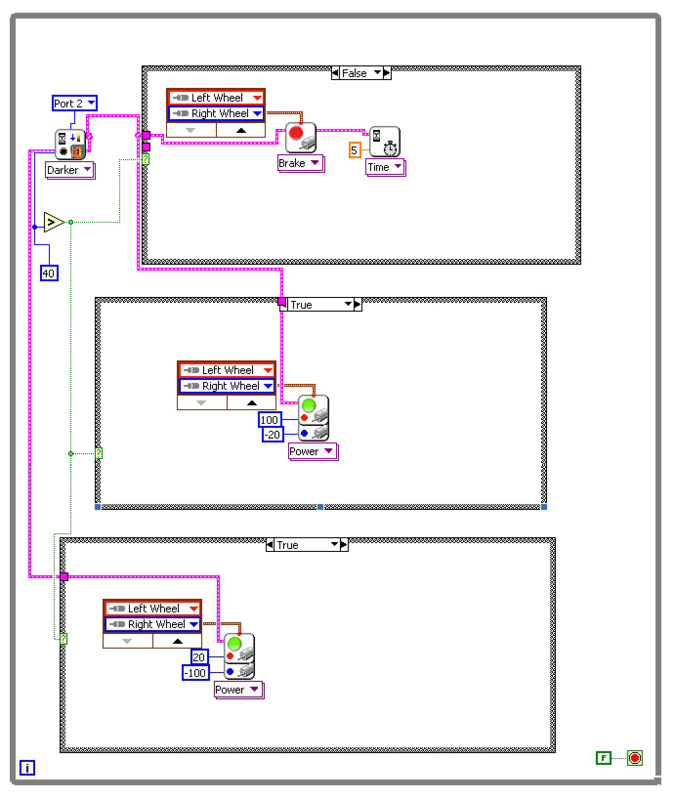 Before we begin, we need to have basic knowledge on LabView programming, although advanced knowledge of this would deffinatly help. We also need to know how to incorporate the sensors correctly with our robot because these are needed in this design challenge. To begin this design challenge, we built a robot that would work with what we were supposed to accomplish. 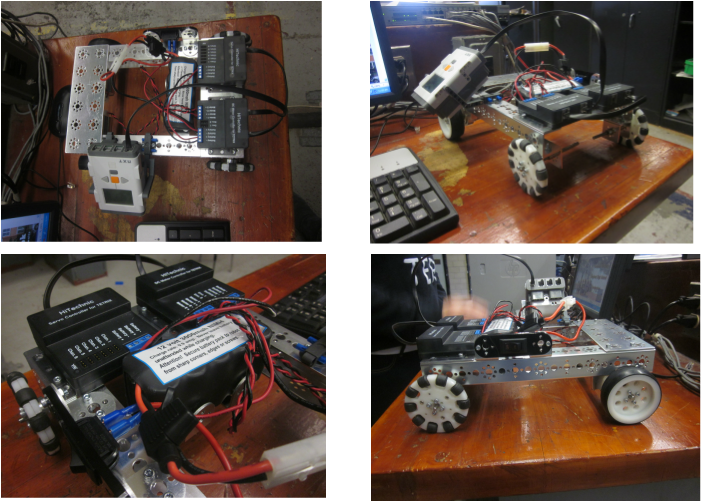 For this particular challenge, we only required a simple design as out robot. We first tryed to use a light sensor to accomplish our goals, so we added this to our robot. Although we ended up not using this, we did not take it off of our robot. After building our robot, we had to figure out how to program it. This gave us a much bigger issue than the design of our robot. After deciding not to use the light sensor, we changed to using amounts of time. By doing this, we ended up going back and forth from our programming area and area of which the challenge took place. After many trials, we finally created a working program, which we then took a video and posted it to youtube. At the end of this design challenge, our robot was able to successfully move to three different spots on the ground, stop at each for a certain amount of time, then return to its starting point. 5. Describe feedback you received during the project (suggestions, comments, etc). From peers, instructor ect. How did you use this feedback to correct issues with your project? During this design challenge, we recieved feedback from our teacher that it would be easier to use an amount of time to control our robot instead of using the light sensor. We had been trying to fix our program many times by this point, and it still was not working. After switching to this new idea all we had to do was trial and error with the different amounts of time. Although the only way to accomplish it this way was trial and error, this proved to be more successful than using the light sensor. During this assignment, we learned a lot about how to program. This is the first design challenge we have done with a complex program. We were very confused at first about how to get it started, but by the end we became very comfortable with it. We had a lot of issues trying to use the light sensor, but using time variables was much simpler. We were able to create a working program by the end of the challenge. 7. If you were to do the project again, what would you do differently and why? Provide reasons and examples. If we did this project again, I would try to make the light sensor program version work. Since we have now successfully been able to make the time variations work, I would like try doing the same project a different way. Since we first started to do the project by using the light sensor and changed it in order to meet the time restraints, I'm curious to see if it is possible to complete the assignment by the light sensor. This is the design of our first prototype. The pictures show the simple structure that we built. We added a resting area for the battery to sit and be stable. We also created a stable structure where we attached the NXT programmer to. The Tetrix Motor Controllers rest on the platform that we put across the two sides of the robot. Although we have not tested this design yet, I believe it will be successful as long as our program is correct. The programming is the biggest challenge during this design challenge. This shows the area in which this design challenge will be taking place. The three black spots represent the houses that we have to visit in a specific order. After a given time, our robot will then have to leave the "house" it is at and either go to a different "house" or exit the area. Our first program attempt was unsuccessful. This was supposed to make the robot go straight if the light sensor reads above 40 and stop for a time of 5 seconds when it's less than that amount. Then it was supposed to turn when greater than 40 and stop when less than 40, again for 5 seconds. After this it was supposed to turn again when greater than 40 and stop forn 5 seconds when less than 40. This would have been the end of the route and the robot would then leave the area. This although did not happen which probably has something to do with having too many case structures in one while loop. Our second program was a success. We changed our idea from using the light sensor, to using time variables instead to meet the time restraints of the class. This program tell the robot to go straight for 2.5 seconds, stop (on the first black dot) for 3 seconds, turn for 4 seconds, go straight for 2 seconds, then stop (on the seconds black dot) for another 2 seconds. This pattern is repeated for the third black dot and returning back to the starting point.